I discovered this little creature hiding amongst our backyard Canada goldenrod two weeks ago this evening. Many of you asked how I ever found such a tiny, well camouflaged insect. This itself is quite a story. 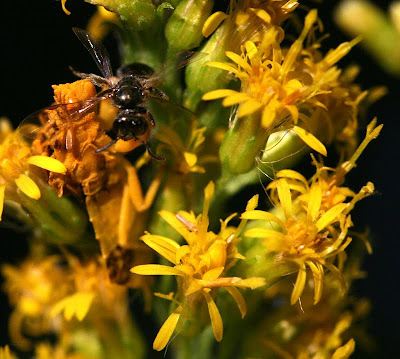 I happened to notice a little bit of discoloration at the edges of one of the clusters of goldenrod heads. Interesting- it deserved a closer look. In the center of this area was a little tiny bee, wasp, or ant that I photographed. But when I went inside that evening to download the photos, I had a closer look at that tiny little dark insect. And wow was I surprised when I saw the bright yellow creature pictured above, grasping the small brown creature with its powerful looking front legs. 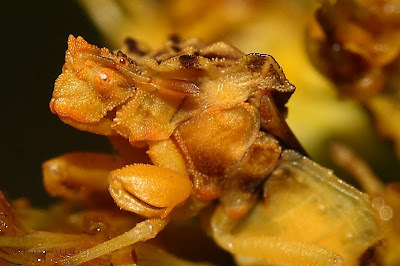 I've been lucky enough to watch this Ambush bug for a week and a half. This past Monday, I wasn't able to find it. Until then, it had stayed on the very same square inch of goldenrod. It would occasionally catch small insects, but I was holding out that someday I'd find it with a gigantic bumblebee in its claws. That didn't happen, but I hope this creature enjoyed its stay in our backyard. I've been photographing all the insect types that have visited our small patch of goldenrod and I'm slowly working through them. I am amazed at just how many interesting things visited our small patch of backyard this year. They are amazing aren't they. You have a great photo. It almost looks like it is grinning. What a strange looking creature! Perhaps the changing weather's prompted it's departure. Wow...amazing photos of this strange creature.